Staff at the Maryland Zoo are celebrating the addition of five new fluffy faces joining the African penguin flock in Druid Hill Park. 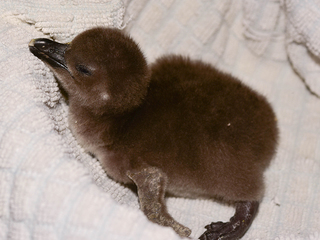 Five hatchlings were born in mid-October, the zoo said. The eggs took 38 to 42 days to hatch. The chicks will stay with their parents for three weeks, being fed a steady diet of regurgitated fish. Zoo staff will monitor the chicks' health during this time, and, at the end of three weeks, staff will remove the chicks from the nest so they can learn that zookeepers will be their primary source of food. This allows staff to feed the penguins daily, as well as regularly examine their health and perform both routine and emergency care, the zoo said in a statement. The chicks will slowly transform in size and appearance as they grow. When hatched, the chicks are about the size of a chicken egg and covered with dark, gray, downy feathers. They then start growing swiftly, reaching their full size of about six pounds at about three months old. At that point, the fluffy down gives way to waterproof feathers. The Maryland Zoo has been breeding African penguins for nearly 50 years, making them a leader in the effort to maintain the species. In the spring of 2018, a chick named "Millie" became the 1,000th chick born at the zoo . The zoo boasts the largest colony of African penguins in North America, with 90 birds inhabiting the exhibition in Baltimore.